“Yes, we did,” I said, helping my 18-month-old up. And we had. We had just come back from adoration and, while coming back, we had met our neighbor, John, and I had spent a good deal of time talking with him, while the children spent a good amount of time playing peekaboo with each other. “What?” I asked, surprised, thinking that perhaps I misheard her. After all, I thought that she wasn’t paying much attention to him at all. “He’s afraid,” she said again. Yes, he was afraid. He had just told me that he had gone to the Emergency Room last night for another stroke and the doctors there discovered a heart tumor and gave him a week left to live. He was all alone in the world, other than the friends that he made, and he was struggling with the enormity of the news by himself. He didn’t want to die, and yet here he was facing death nonetheless. And he wanted to say goodbye to us, just in case he didn’t get another chance, and tell us how much he appreciated us as neighbors. And apparently, my daughter perceived more than I thought she had. And then I helped her into the house. 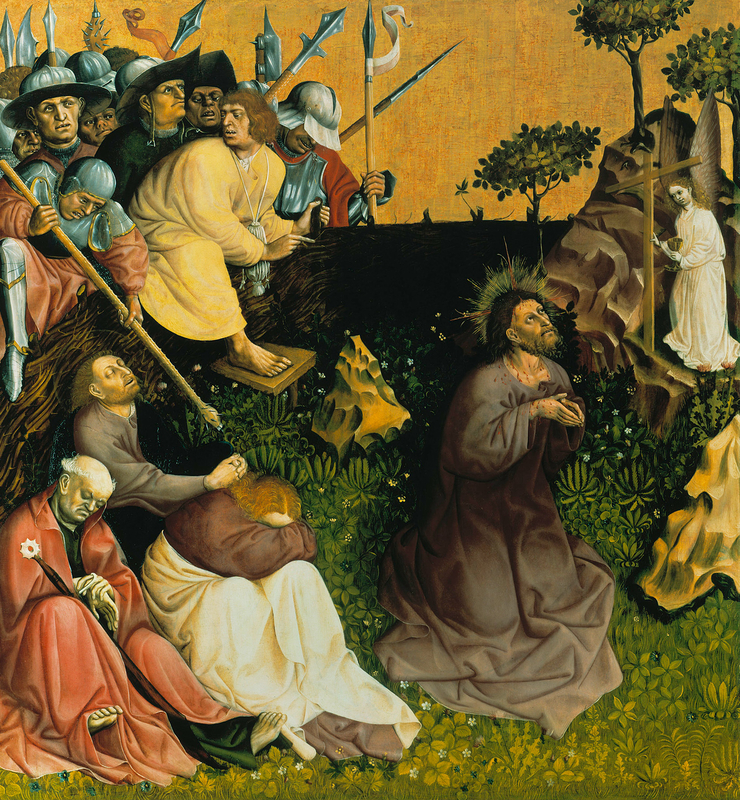 Christ on the Mount of Olives, by Hans Multscher, c. 1437. Gemäldegalerie, Berlin, Germany. This is one of the pictures that I chose for the upcoming book that I am working on — The Sorrowful Mysteries — which should be available sometime before the beginning of Lent. (The beginning of Lent, coincidentally, corresponds with my due date for Baby #3, so I am trying to finish it now so I can get into the proofing stage as quickly as possible!) More details about that as I get farther along! Anyway, normally in these sorts of pictures, Christ is portrayed with a whiter skin tone — rather like the angel that He is praying to. Why white? Because white is commonly used in European art to represent purity and heavenly beings, and Christ is a pure sacrifice. So, while the men in the picture have ruddy faces, Christ will generally have a pale face. So, when I first saw this picture, with Christ’s ruddy face, I immediately thought that there was a mistake with the coloring. And yet, when I looked at the quality of the image, I knew that the coloring had to be right. Instead, Christ had a ruddy face. And I think one of the reasons why Multscher chose this color was to emphasize Christ’s humanity. After all, He was a man as well as God. And He prayed, just as any man would pray, that this cup that He would accept would pass away from Him. In a way, I am so thankful that He had this conversation, because death is a scary thing. As an adult, I am not quite sure how to convey the enormity of death to my children, though I know that one day that they will face it in its raw, ugly form. To be separated from those that we love in this fashion seems cruel and it can be hard to even grasp it. As C.S. Lewis once noted, our hearts truly yearn for eternity, and when life is taken away from us, it seems like an injustice beyond imagining. And to face it head-on? I can’t even imagine. But, the Agony in the Garden reminds me that Christ truly did face everything that we faced. After all, wasn’t He horrified of death, just like we are? And yet, He faced it with courage — and not only that, but destroyed death so that, when we do die, we may trust in His embrace and mercy. What is the most horrifying part about death for you? Look at Christ’s face. What does His expression look like to you? How do the colors emphasize the tension of the scene? Thank You for facing the horror of death and destroying it for us. Pray for us, especially those of us who face death now, that we may find courage and mercy in You.